The outside diameter of the spigot ring should fit the wheel's centerbore in the back of the wheel. The inside diameter is the size of the wheel hub on the vehicle you intend to fit the wheels to. Compatible with: Fit for any vehicle with a 78.1mm hub that needs to adapt a wheel with 108mm center bore. Please ensure the size of your car fit our item before purchase. [Benefits 1] Eliminate vibrations caused by the wheel not centering correctly onto your vehicle's hub. 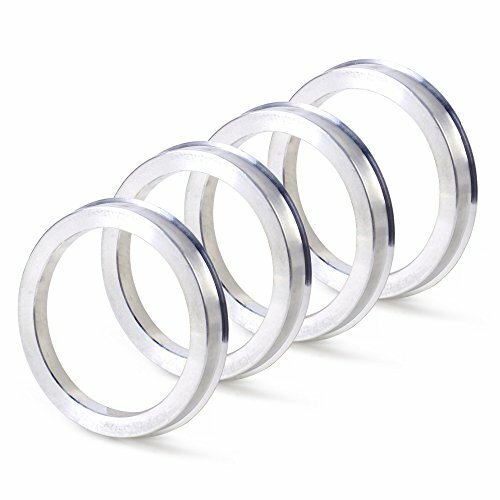 [Benefits 2] Aluminum hub rings, heat resistant so it will not melt in even the most extreme driving conditions. [Vehicle Specific Fitment] Fit for any vehicle with a 78.1mm hub that needs to adapt a wheel with 108mm center bore, such as Chevy Suburban Silverado Express 1500 Tahoe, GMC Yukon Sierra Savana 1500. Please ensure the size of your car fit our item before purchase. [Specification] Inner Diameter: (Vehicle Hub Size) 78.1mm; Outer Diameter: (Wheel Bore Size) 108mm; Depth: 10mm. [Material] High Quality Aluminum, never break, never bend, offer a tighter fit. If you have any questions about this product by ZHTEAP, contact us by completing and submitting the form below. If you are looking for a specif part number, please include it with your message.